When you’re managing properties, you have a host of obligations under the Health & Safety Act and so do your tradies. By law, electricians and gas fitters must provide compliance certificates before the job has to be paid. They are also legally required to advise you of any areas of concern they notice while carrying out work on your premises. So, the question is.... Are you getting what you should from your tradespeople? Chances are, your tradespeople are doing a great job. How do you keep track of all that information? The answer is iCert. iCert is the leading code compliance management tool in New Zealand. It’s proudly Kiwi made… and it’s free for property and facility owners to use. 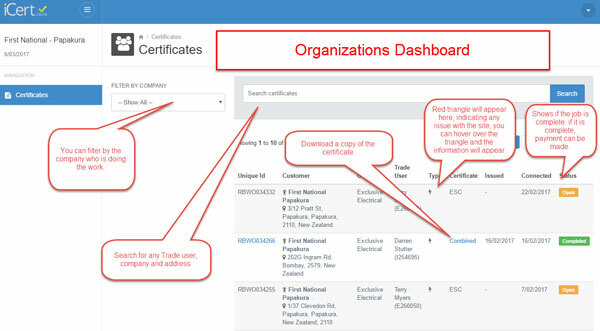 iCert tracks and stores information from the moment the job is logged through to issuing that compliance certificate. And because it’s accessible from any internet connected device – all linked parties can see the status of a job and any compliance issues in real time! You get your own login and there’s no limit to the number of tradespeople who can connect to you. All they have to do is assign your organisation to the jobs you give them – and the information will be at your fingertips and securely stored forever! Get in touch with us and we’ll set you up with your forever free access. It just might be the best business decision you ever make. PS: To help you get your tradespeople on board, we’ll give those who aren’t yet using iCert free access for 90 days when you say so. That means no excuses to put you all on the same page.